Senior congressional leaders are renewing their focus on an investigation into efforts by the Obama administration to obtain highly classified intelligence information on Trump administration allies in what many allege was an effort to undermine the president and his national security team, according to conversations with multiple senior U.S officials familiar with the situation. The recent admission by Obama administration National Security Adviser Susan Rice that she requested the unmasking of Trump associates named in highly classified intelligence community reports has placed renewed attention on an investigation into why this information was obtained and then leaked to the press. In addition to Rice, former United Nations Ambassador Samantha Power and other senior Obama officials made hundreds of similar unmasking requests in what many allege was a campaign to handicap the incoming Trump administration's national security agenda, according to multiple sources familiar with the ongoing investigation into the matter. The unmasking requests—a score of which were made in the final year of the Obama administration—could be just one part of a larger effort by the former administration to monitor the activities of Trump associates in the lead up to the 2016 election, according to these sources. The subsequent leak of this classified information to the press has further fueled accusations that the former administration aimed to smear Trump’s team. Congressional leaders and other insiders told the Washington Free Beacon that the investigation into the Obama administration's unmasking campaign is gaining greater steam, even as the federal probe into alleged collusion with Russia drags on. "The misuse of intelligence information by members of the Obama administration is a serious issue that requires an exhaustive investigation and accountability," Rep. Ron DeSantis (R., Fla.), chair of House Subcommittee on National Security, told the Free Beacon. "From the unmasking exploits of Obamaphiles like Samantha Power to the leaking of FISA [Federal Intelligence Surveillance Act] material, this behavior has eroded public trust in America's intelligence apparatus and has imperiled the future authorization of key counterterrorism programs," said DeSantis, who has named other top Obama officials, such as former White House National Security Council member Ben Rhodes, as primary suspects in the subsequent leaks of this information. "Congress has a lot of work that needs to get done." 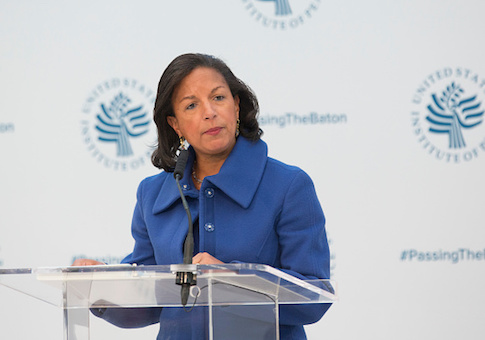 Rice, who at first denied any role in the unmasking effort, admitted before lawmakers earlier this month that she had in fact requested the identities of Trump transition team members that had been hidden in classified intelligence reports to protect their privacy rights. Some of this information later leaked to the press, fueling months of critical coverage and an ongoing federal probe into allegations of collusion with Russia. "The media stories reporting that Susan Rice admitted to unmasking Trump officials—after initially claiming she knew nothing about it—have refocused a lot of attention in Congress on this issue," said one senior congressional source with knowledge of the matter. "The ensuing media reports that [Trump transition team member] Paul Manafort was wiretapped have further intensified the sense that Obama officials were using intelligence products to keep tabs on Trump's team." The investigation into these unmasking efforts continues to focus on top Obama officials, particularly Power, who is said to have had little need to unmask such sensitive classified information from her perch at Turtle Bay. Rep. Sean Duffy (R. Wis.), another Republican member closely tracking the unmaksing scandal, encouraged his congressional colleagues to move past the Russia probe in pursuit of the facts about Obama's potentially illicit spy operation on Trump associates. "Hillary Clinton and ‘resist' Democrats still refuse to acknowledge that their bad ideas led them to lose the 2016 election, so they've created this Russia narrative to undermine President Trump and to justify their loss," Duffy told the Free Beacon. "The real deep-dive investigation should be on the breaches of national security by unmasking of American citizens and the leaking of sensitive information by the Obama administration and Deep State." The latest disclosures about the investigation's progress are said to have validated and confirmed much of the unmasking information first unearthed by Rep. Devin Nunes (R. Calif.), chair of the House Intelligence Committee, which is handling the investigation. While Nunes took heat for first presenting evidence of the Obama administration's unmasking effort, the latest disclosures and additional information gathered during the ongoing investigation points to a larger effort by the former administration to spy on private citizens affiliated with the Trump campaign, according to these sources. "The Russia hysteria wasn't only manufactured to undermine Trump's legitimacy, although that was part of it. It was also used to retroactively cover the Obama administration's illegal use of American intelligence capabilities against American citizens," said one veteran congressional adviser with knowledge of the matter. "This goes back to just after the election, when they ran to friendly reporters and planted stories about leaving a trail of evidence on Russia hacking," the source said. "It also includes dumb tricks like retroactively loosening restrictions around surveillance." The leak of this classified information to the press cost several Trump administration officials their political careers, including his original National Security Adviser Michael Flynn, who was subjected to scores of leaks meant to undermine his role in the administration. The first evidence of a coordinated campaign to undermine Trump's national security team began even before the January transition, when the outgoing Obama administration helped plant a series of damaging stories about Trump officials, including Flynn and CIA Director Mike Pompeo, a former member of Congress who clashed repeatedly with the former administration on its efforts to ink the landmark nuclear deal with Iran. A second senior congressional source familiar with the situation told the Free Beacon that the Russia investigation has exposed damaging information against senior Obama administration officials, rather than Trump. "Congress is determined to follow the facts wherever they may lead us. And, ironically, the most damning revelations of the Russia investigation thus far incriminates the Obama administration," said the official, who was not authorized to speak on record. "Susan Rice's admission to widespread unmasking against Trump associates may just be the tip of the iceberg. We are going to get to the bottom of this." A former senior White House National Security Council member, speaking to the Free Beacon on background, said that unmasking requests are atypical and treated with great care. "It was understood in the Bush administration that unmasking was out of the ordinary; it was something rare that you might sometimes do but needed a special and easily defensible reason for doing," said the former official, who served in several Republican administrations. "You could not ask out of mere curiosity, nor obviously for political reasons. There needed to be a clear, direct national security justification." The hundreds of unmasking requests by Power—which amount to nearly one a day—are extremely suspicious, the former officials said. "It is very hard to see how an ambassador to the United Nations would ever, one single time, have such a justification, much less have hundreds of occasions for this kind of invasion of Americans' privacy," the former official explained. "It looks like either politics, or prurient interest." It remains unclear why the actions of the former Obama administration did not raise red flags at the National Security Agency and other intelligence bureaus. "The system failed here, because at some point the NSA should have protested to the White House, or the Justice Department, about these abuses by Samantha Power," said the former official. "Congress should inquire whether it ever did, and if so why the White House did not shut Power down. If NSA never protested, why not? Don't they have any system that identifies such abuses and tells them how they should be handled? If not, have they established one now?" This entry was posted in National Security and tagged Obama Administration, Samantha Power, Susan Rice, Trump Administration. Bookmark the permalink.